Here are some square motives that I have done. and they all have possibilities. This one is a simple 4 ring base with a ring and chain border and with a little playing with the photo it could be assembled to look like this. Either way it's going to leave some big gaps between motives. Here's another one that I was working in a strip until I fell out of love with it. The gaps between are too big again. I've been playing with another square I designed and I want to turn this one into something more than just a square motif, but I don't have a lot of time to play around with it. 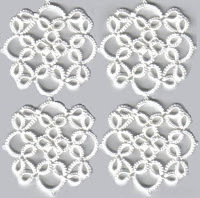 The design is fairly solid, at least solid for tatting. I used very tiny rings so that I didn't have really wide open spaces, but at the same time the long chains in the corners allow for some negative space to attract the eye. The intersection of the corners is pretty, and I thought I'd try to invert the shape to reproduce the effect on the outer edge. Sort of like this..... See the problem? 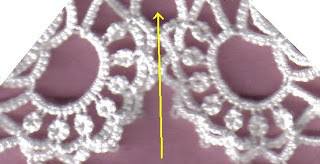 To get outward facing curves I need to tat it from above, which I could do, if I worked it first and attached it using a separate row, repeating the corner sections as shown here. But you can see the problem, I'd have to work 3 rows before the joining row and I'd end up with points at the intersection of each pair of motives rather than a straight edge. 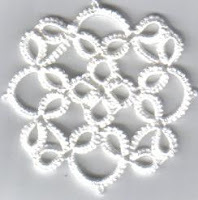 After some consideration of how I might do this weird inverted tatting, I thought I'd just repeat the corner arch instead. Which created it's own set of problems. 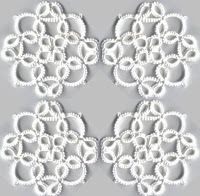 These 4 rows worked around 4 motives took about a week of tatting. (We were doing income tax, which didn't leave a lot of brain cells or tatting time.) It's ruffled. Badly. Another row may make it flatten out, but I doubt it. And now that it's on there I don't think I like the idea after all. The only solution is to cut it off and start over. An edging without a corner is only half a design. 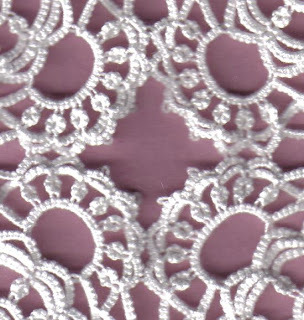 A motif without an edging to finish it off is likewise incomplete. The next time you see this motif it will have metamorphosed into something different.